I have always loved books and I have always wanted my children to love books as well. Even before I seriously thought of having children I was saving books for them. I still have most of my childhood books and I have eagerly waited for my kids to be ready to read the stories I loved when I was their age. I have even written before about how I enjoy recommending books to my daughter. But how do you convince children that reading is fun and not a chore to be gotten through as quickly as possible? How do you make reading and books as automatic as breathing? First of all, and you would think this would be obvious, read to them. I am amazed when I hear parents say that their child is too young to be read to or too young to appreciate books. Your child is never too young to be read to. Read to them when you are pregnant, read when they are newborn, read when all they want to do is chew on the pages. If you start trying to read to a child when they are three it will be hard to keep their interest. They will wander away and get distracted. If you read from infancy it will be a habit. They will associate reading with you, with comfort, with something they enjoy. Read to them often. One book read quickly at bedtime is not going to turn your child into a book lover. Read what they want, even if it means you read the same book 500 million times. Children love repetition, parents not so much. Do it anyway. I still have The Going to Bed Book by Sandra Boynton completely memorized from years of reading it to both kids. Let your child see you reading. It does no good to tell your child how awesome reading is if you never do it. Children can smell a hypocrite a mile away. Books should be readily accessible. Have a basket or a bookshelf where they can go and pull out the books they want to look at whenever they want to do so. Books shouldn't be put up as special and untouchable. They should be everyday objects. Take them to the library. Make it a fun excursion. Let them pick their own books, even if it means they get the exact same books they got two weeks ago. Remember, kids like repetition. Keep up with your child's comprehension. 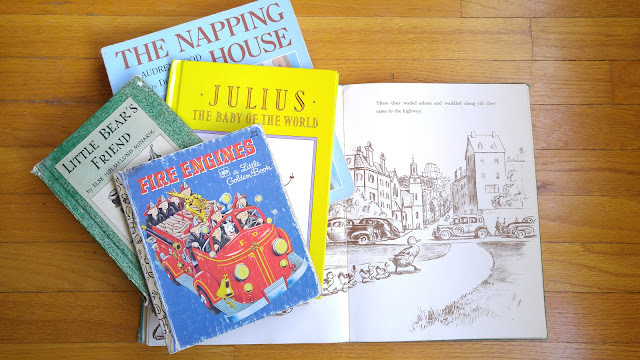 A 5-year-old may only be able to read a picture book by himself, but that doesn't mean that is the only thing he can understand. His comprehension is above his ability to read at that point. Read the chapter books to him. Don't try to turn every book into a learning experience. Let your child just enjoy the story. If they want to talk about it, that's fine, but no one enjoys always being taught a lesson. I know teachers are very into reading at grade level but I don't always agree. Many kids want to try a book that is supposedly too hard for them. If you let them try they might succeed beyond your wildest dreams. If you talk them out of it they might not try again. Do you want to stifle their initiative? By the same token, it isn't going to hurt them to read books that are too young for them sometimes. My son went through a stage when he was much younger when he read all his little sister's picture books when we got home from the library. They were way below his reading level but he enjoyed them. That is what you are going for, enjoyment. Do you always want to read a challenging book? I didn't think so. Neither do our kids. Sometimes they just want to read something easy and that is fine too. Remember that your kids are not you (this one is hard for me!) They may not love the same books you did (Oh, the horror!) Find the books they love. My son developed a love affair with Star Wars books at a very early age. That did not come from me but that is fine. It is really the love of books in general you are going for, not the love of a few specific books. Besides, some day he will be desperately trying to convince his children that Timothy Zahn is the best science fiction author ever and I will get a lot of pleasure out of watching that. Don't make reading a chore. Being told you have to read a certain number of minutes or a certain number of chapters is a guaranteed way to destroy any desire to read. Buy books. They don't have to be expensive, thrift stores frequently have books for sale, but buy them. The library is wonderful but sometimes you just need to own the book. Kids understand the joy of possession. Teach them that books contain not only stories, but knowledge as well. The internet is all well and good and you can google almost anything but sometimes it is wonderful to give a child a book that tells them what they want to know. Is your child interested in the solar system? There is a book for that. Maybe it is sharks or dinosaurs or how to crochet. There is a book for that. Children can really enjoy poring over a book that fits their interest. They might find their answer quickly online but they will find answers to many things they didn't realize they wanted to know if they read a book. I firmly believe that one of the most important things you can give a child is a love of books and reading. Worlds are opened for them. Knowledge is at their fingertips. Tolerance and empathy are learned. Imagination is sparked. Boredom is impossible. All you need is a book.